Hey! Here's a new video I've made playing the aforementioned songs. It's indoors and well lit so it should be easier to see. Please let me know anything that I could improve on. I've only been at it for about 2 1/2 years and there are people on the forum much more qualified to advise you than me but I'll tell you what I'm seeing. You seem to be doing well with your intonation. Its probably best you look at your bowing. If you look at your video you can see that your bow is moving in ab 'arc' rather than a straight line. You seem to have too much movement in the shoulder and need more flexibility in your wrist. You also seem to be having to lift your elbow much higher than would be comfortable for me. Think about how you would bow if you couldn't move your shoulder back and forth. It's mostly forearm movement and you use the flexibility in your to keep the bow at a 90 degree angle to the strings about half way between the bridge and the end of the fingerboard. If you can get those sorted you will be sounding great. 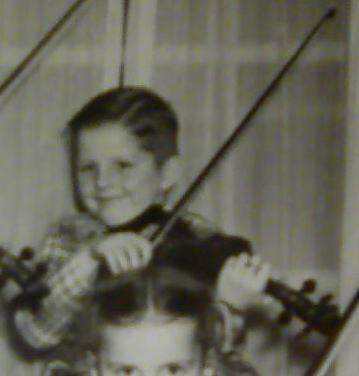 @SecondFiddle : Well first off, Ryan, there's not much to go on because all we can see is your right arm and part of the violin. Move back from the camera so we can see more of your whole upper body (from waist up). We can't see your left hand at all. It appears that you are bowing over the fingerboard and not between the fingerboard and bridge. Your right arm / elbow has no flex, you are playing / bowing with your whole arm, like you have a cast on your arm all the way to your shoulder. Try picking some easier slower songs to begin your learning process. The problem with many beginners is that we want to try and play songs we're not ready for yet. It's like putting the cart before the horse. Work on your bowing, long smooth bow strokes, there is a reason our violin bows have 26" of hair, it's to be used. Work on your bowing first, there's no need to jump into playing harder songs. I pretty much agree with @Fiddlestix above. In an earlier critique of you, I wrote to the effect that you need to suppress most shoulder action in drawing the bow and to get the elbow and wrist involved. Really I neglected to mention the fingers. I've come to notice that the fingers are even more important than the wrist in keeping a straight bow. So you should give attention to your bow hold. It's not hard to learn. See the videos by Fiddlerman, violinlab, and violinmasterclass, and see the treatment of the right hand in Galamian's Principles (free pdf online). You'll see that they lay out the details and that they are all saying pretty much the same things. You would practice the bow hold offline, meaning while you are not trying to play. I consider that the most important thing in the usual bow hold is that the thumb should touch the stick only on the tip of the thumb. That will do more than anything else to keep the stick drawn in close to the hand and will keep the thumb and pinky bent, which yours aren't. Once your bow hold is basically in shape, there is a training device called the Bow Right (and something similar, whose name escapes me, sold by fiddlershop) that I believe would get your bowing on track PDQ. OBTW, parts of your Angelina are sounding great! @SecondFiddle Cool! Are you reading the music or do you have theses songs memorized? If memorized I am impressed!! This has been one of the hardest things for me!! My Teach taught me an exercise. Place your 3rd finger on the string and while never lifting it, rock back and forth while placing your pinkie then lifting it and placing your 2nd finger in the high and low position. I have been working on drumming my fingers on a flat surface. I can drum quickly and evenly in order pinkie, ring, middle then index but I am slow at drumming in the opposite order index, middle, ring, pinkie. here is a small exersize stand in a door with you should on the jam. the hold your elbow on the jam while bowing. @Ferret thanks for pointing that out, I worked more in front of the mirror this week to work on that. @Fiddlestix I had the camera set like that intentionally since most of the comments on my last video were about bowing. Also I didn't pick these songs, these are what my teacher is having me work on right now. I did work on playing them slower this week though, in front of a mirror. It helped a lot. Thank you for the advice. @RosinedUp I have started practicing my bow hold outside of practice lately. At work when no ones around ill hold my pen like my bow and also do bowing motions focusing on my forearm and wrist. Unfortunately I've noticed the latter disappear immediately when I pick up my bow though. Thanks for the resources, I will check them out. I'll also make sure my next video shows my bow hand. And I plan on getting a bow right-- the thing is I can only use my card as a debit card right now so I can't order anything online. And thanks! I've been working hard on it. @Schaick I have em memorized! I'm not very good at sight-reading so if I learn from sheet music I end up memorizing it so I don't have to read it. This annoyed all of my piano teachers, because it led to me looking at my hands while I played (looking at the actual music distracted me). Thanks for the exersize, I'll try that. I do the drumming thing when I think about it, but not as much as I probably should. @OldOgre I hadn't thought of that! I'll start doing that. Use almost exclusively your fingers when doing the pen thing at work. Not so much wrist. The scratchy sound you are getting is from too little bow and too much downward pressure compared to the amount of bow you are using. When beginning a piece place the bow down carefully with less pressure and move the bow right away. (Referring to the very first playing on the video). When fixing intonation on the double stops. Take the time to play a steady chord and fix the intonation, then memorize the feeling of your hand when it's right, and do it again over and over.... One million times. Hey there.. you are learning some tunes. I think you are on your way to a Good Angelina Baker. Keep on practicing, you are coming along great! I want to learn Angelina Baker. If I recall there was a group or a project back in the day. I am going to search the old posts and see if I can add that song to my song list.